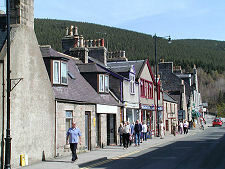 Ballater is the attractive village that puts the "Royal" into Royal Deeside. It achieved lasting fame as the nearest settlement to, and railhead for, Balmoral Castle, which lies eight miles along the River Dee to the west. The railway first came to Ballater in 1866, when the Deeside Railway built its station here. Whether this fed the tourist boom, or simply took advantage of the draw created by Queen Victoria when she purchased Balmoral in 1852, is debatable. 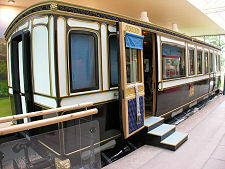 What is certain is the regular use made of the new railway by the area's occasional royal residents and their guests and visitors. 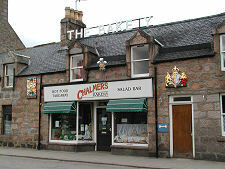 Much of the royalty of nineteenth century Europe passed through Ballater railway station at one time or another, including the Czar of Russia in 1896. This ever more prestigious traffic doubtless led to the rebuilding of the station to a rather grander scale in 1886. The railway service to Ballater was sadly among many that were cut in 1966. 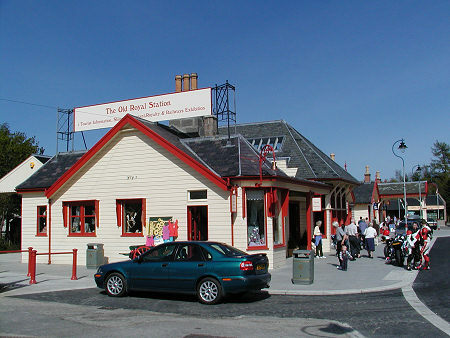 Even more sadly the very nicely restored Old Royal Station, which was home to Ballater's Tourist Information Centre and to an exhibition celebrating the town's railway past and Victorian links, was destroyed by fire early on the morning of 12 May 2015. 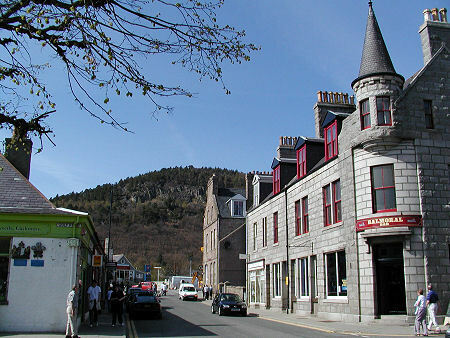 Ballater's origins date back to the early 1300s when the area became part of the estates of the Knights Hospitaller of the Order of St John, having previously been owned, until their demise in 1307, by the Knights Templar. Its location has always been a strategically important one, commanding both the Dee Valley and Glen Gairn, running north to Strathdon. Ballater has also regularly been used as a convenient crossing place for the river. Thomas Telford built a bridge here in 1809, though it was washed away in serious flooding twenty years later. Residents and travellers had to make use with a ferry for five years until the bridge was replaced. 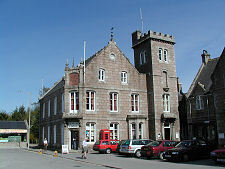 Today's Ballater continues to serve as a touring centre for Deeside and beyond. 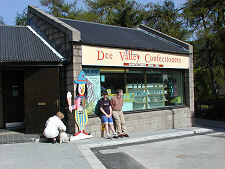 A stroll around the village reveals a fascinating range of shops and services. 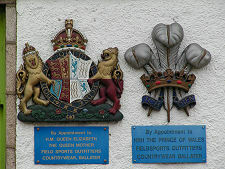 Equally fascinating, and indicative of the continuing Royal presence in the area at Balmoral, are the collections of "By Appointment" signs adorning many of the businesses in Ballater. 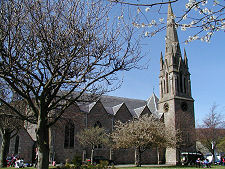 The centre of Ballater is dominated by Glenmuick Parish Church, which is open to visitors. 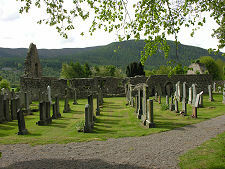 You can also visit the remains of Tullich Kirk, just to the east of the town. The onward trail through Royal Deeside extends west from Ballater along both north and south sides of the River Dee. The older and narrower road sticks to the south bank before passing the Royal Lochnagar distillery as it approaches Balmoral. The main road runs along the north bank of the river. The two meet at the large car park that serves Balmoral Castle and Crathie Church. 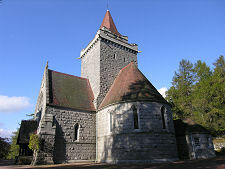 Crathie Church is the church frequented by the royal family when they are staying at Balmoral and, largely as a result of this association, is a popular attraction in its own right. 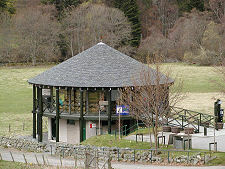 It is located on the hillside on the north side of the main road, opposite the car park and its unusual circular, stilted, tourist information centre.